Low heat capacity and exceptional thermal conductivity from materials used for constructing of copper-aluminum coil results that heating emitters from Verano achieving operating temperature relatively quick. Central heating installation together with heating emitters being based on the copper-aluminum coil may achieve its full working efficiency during the 3 x shorter time then comparing to installation based on radiant panels or underfloor heating systems. Very low thermal inertia and their quick adaptation for any changes in a room but also the fact that heating emitters deliver enough heat output to keep the constant temperature all the time, it is possible to reduce heating bills for c.a. 12% - 45% comparing to other systems based on heating emitters. A heating installation with emitters from Verano, due to its low thermal inertia would adjust itself immediately as in reaction of any change of temperature in a room. Exceptional low energy consumption of our convection heating emitters is achieved thanks to low water content and relatively low self-weight of such units. Modern heating sources such as gas or oil fuelled condensing boilers, heat pumps but also smart controls – mechanical and hydronic valves and valve-heads that orchestrate with convection heating emitters would also enable significant savings on home or light commercial building energy bills. Heating emitters manufactured by Verano may work very well with any kind and type of controls, what also will also influence a decrease in a heating bill. Transferring a heat through convection enables a distribution of temperature more regularly due to natural circulation of warm and cold air in a room. A natural convection of an air in a room is positively influencing of its (ab. : eliminating layers of air that include high density of exhaled CO2 ). Due to using appropriate control valves and thermostatic control valves heating emitters would adjust a temperature up to demanding level and would also create appropriate thermal comfort and healthy micro-climate. Heating emitters from Verano are well known from voiceless and reliable operation. A high quality of materials being used for manufacturing of copper-aluminum coil would ensure its resistance against rust but also low influence from the bad quality of boiler water. Thanks to using hot dip zinc – magnesium coated sheet (a material that may delay a creation of so called white corrosion) any heating emitters from Verano may be more corrosion resistant. The characteristic feature that distinguish heating emitters from Verano is their long-standing durability. This happens due to our constant care about being very precise in every single technology being used during manufacturing process. Heating emitters from Verano are well known from voiceless and reliable operation. At Verano we carefully select any raw materials, i.e. for coil of heating emitter we use aluminium with very good thermal conductivity: 204 W/(m2·K) for aluminum, 384 W/(m2·K) for copper. Also heating emitters from Verano have large area of heat exchanging. Natural convection heating emitters would adjust themselves in the quickest and most efficient manner in order to cope with the changing conditions of indoor climate requirements, when many types of heating emitters are concerned. The way convection heating operates would not result overheating of any room. 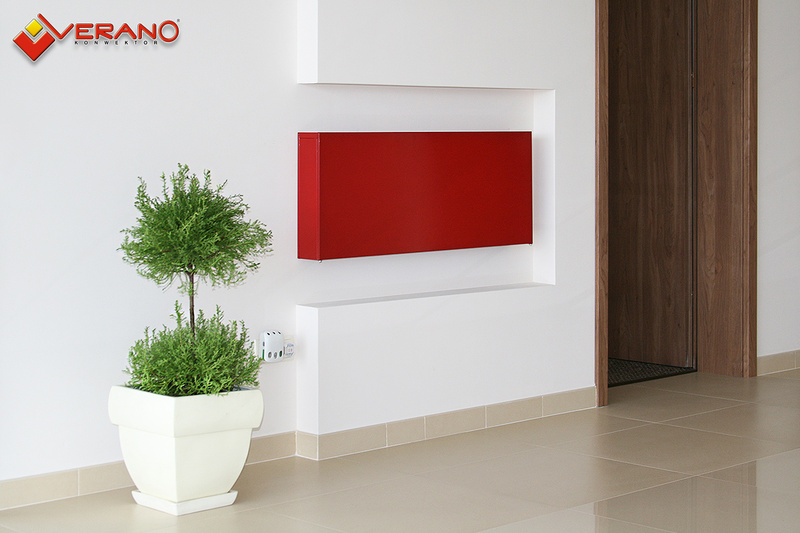 Highly ascetic design of convection heating emitter from Verano may creating a decorative element of a room or office. Any colour being used on the cover would orchestrate even the most sublime interior design requirements. Such a convector heaters would be composing well to any room in a manner to create a comfortable but discrete heating emitting system (trench heating) or expose them by creating a wall-mounted and LST designer convectors what would definitely suit any ambitious interior designers. A specific construction of heating emitter manufactured by Verano allows to avoid any direct contact of aluminum and copper with water (as it is just floating inside the copper pipe). Verano heaters are not influenced by any bad quality waterworks water and does not require any additional anticorrosion protection. Corrosion resistance of Verano heating emitters is determined by precious metals that are used for coil manufacturing (copper pipe).